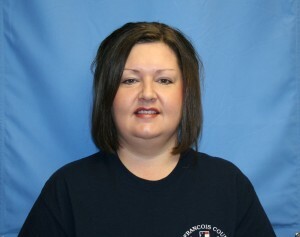 Kristy Halter started full time at Saint Francois County Ambulance District (SFCAD) on May 26, 1998. During Kristy’s senior year of high school, she job shadowed a few hours each week here at SFCAD. She would help out with office duties and caught on quickly to new tasks. Upon graduating high school, she was hired full time. Her first position was as our billing clerk. It was obvious that she was eager to assist with anything the service needed, even driving our non-emergency transport wheelchair van. She then became a car seat technician in addition to her billing duties. She became interested in information technology (IT) when we transitioned to laptops for electronic reporting. Kristy quickly took on the in- house role as the “IT go-to person.” In 2015, Kristy was promoted to the IT/Education Account Manager. Kristy is an amazing employee and an all-around great person. She is the one all others run to anytime anything goes wrong, whether it be with IT or education. Everyone’s response to questions they cannot answer is, “ask Kristy,” “take it to Kristy,” or “Hey Kristy!” She always answers with “Yes.” Each day, she is pulled in a thousand different directions and always manages to complete every task that she has in front of her, without complaint and always with a smile. Kristy has been married to her husband, Chris Halter, for 15 years, and they have two wonderful children, Carter (11), and Kendra (7). Kristy is a very important part of our service and helps to keep it running smoothly. The staff of SFCAD is extremely proud to have her as part of our team.